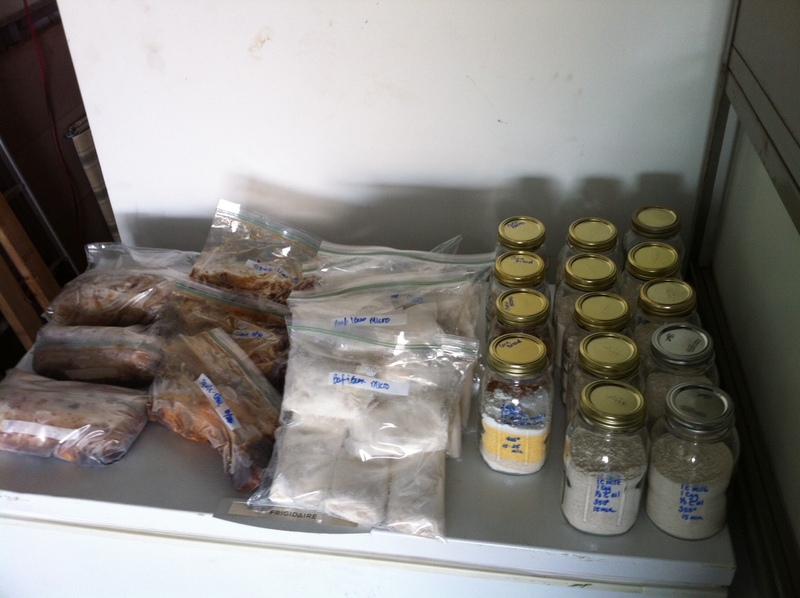 I decided to prepare and freeze some meals to be ready to cook on days when we have little time in the evening because of basketball practices and games. Since Friday, I made 10 muffin mixes, 4 cornbread mixes, 40 burritos, 3 Tequila Lime Chicken meals, 3 Teriyaki Chicken meals, 2 batches of crockpot applesauce (3 pints in the freezer from what was left) and about 3 cups of taco seasoning mix. I didn’t really want to spend a lot of money or time. I looked in my pantry to see what I had. I had a couple bags of flour, one white and one wheat. I also had a fair amount of cornmeal. At store I bought bulk chicken and hamburger on sale. Most everything else I got at Aldi. I looked in my Mega Cooking cookbook and found a cornbread recipe. 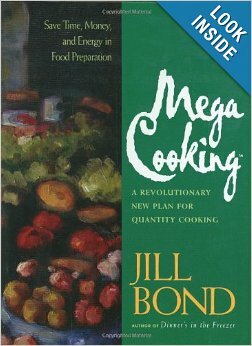 If you every wanted to cook and store large amounts of food this cookbook is for you. It teaches you how to do it all! Bake at 425 deg for 15 – 25 min. Bake at 350 deg for 15 min. ***UPDATE*** I’ve baked two batches of these and they seem a little dry. I’m not sure if it is the whole wheat flour or what is causing it. I would suggest to add 2 eggs instead of just 1. Please comment below if you’ve tweaked the recipe so it isn’t so dry. 🙂 Thanks! Taco seasoning didn’t take long at all either. Mix well and store in an air tight container. The next few recipes I got from Fix, Freeze, Feast cookbook. I would highly recommend this one to be on your shelf! Brown beef in a large stockpot over medium heat until no longer pink. Drain fat. Add taco seasoning and water. Simmer until liquid is almost gone, about 20 min. Then I had a little assembly line going. I put refried 1/8 cup beans on tortilla, 1/4 beef, and 2 Tablespoons cheese. Then I wrapped it burrito style. Some I wrapped in wax paper to be cooked in microwave and the others I put in foil to be baked in oven or toaster oven. Then I put them in the freezer bags and froze them. I found a recipe for Crockpot Applesauce on Pintrest. I did substitute the water for apple cider. Cook in the crockpot for 8 hrs. Mash with a potato masher after 8 hours. These are really yummy. My husband tasted them and said, “This is like applesauce on CRACK.” I’m not really sure what that means but he seemed to enjoy them!! ***Update*** Check out the post on freezer cookies… YUMMY! Hope this helped inspire you to get prepared for the up coming busy holiday season. Do you have any freezer meals that your family loves? Please share below! This entry was posted in Chanyn, healthy living, Home, Meal Planning, Recipe. Bookmark the permalink.